Holiday decor seems to change every year for me! Since I dabble in woodworking and love painting, I am always making new things for my mantle or porch! Every year I have a favorite, and this year, it may just be these! I had some extra bells hanging around from another project and so I wanted to put them to good use. 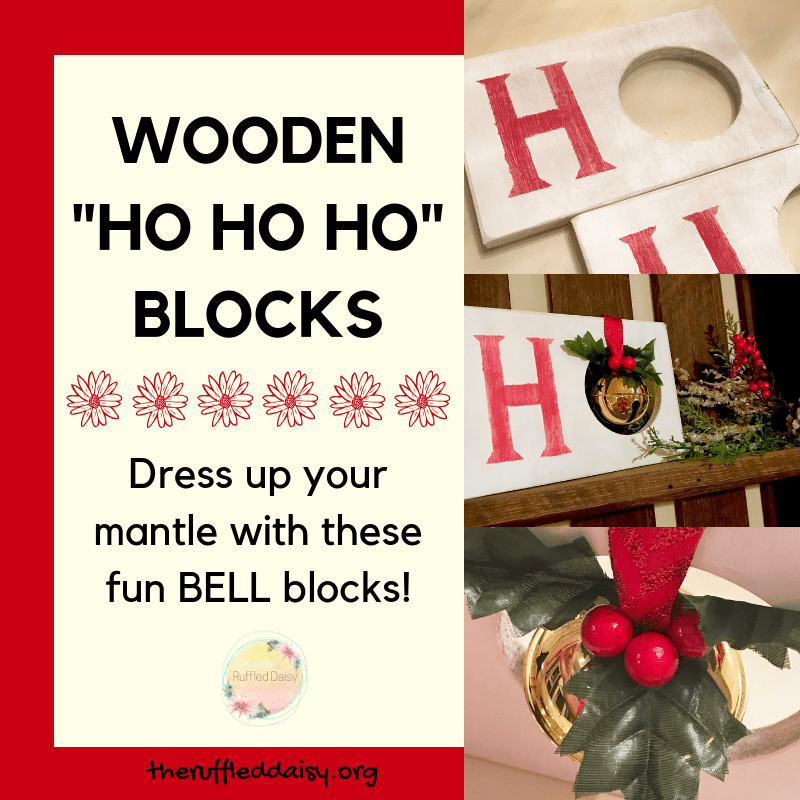 Here’s how to make your own “Ho Ho Ho” Wooden Blocks! You’re going to need three pieces of wood that are approximately 6″x10″. I use pine wood which makes for easy cut and it’s wide enough to stand on it’s own. You’re also going to need a drill bit that you use to make door handle holes. This isn’t a common piece that most people have, so you can get one HERE! Once the white paint is dry, it’s time for you to apply the “H” stencil. I did one light coat but you can do two depending on the look you are going for. Once your paint is dry, you can sand it lightly or leave it! It’s totally up to your decorating style. The last step is what makes this piece amazing! I used this 3″ bell and took some attached some Christmas greenery to it with glittery ribbon, as shown below. Then I glued it to the top and back of the wooden blocks so it hung nicely in the hold that you drilled previously. Now you’re ready to display them on your mantle or hutch! These would also make a great gift for something that loves Christmas decor! What do you like to decorate with around the holidays? Do you use traditional red and green colors or do you step out of the box and use other colors? So cute! I am a traditional red, green, and gold Christmas decor kind of decor. But I love that you could customize this to what ever colors you want. This is such an adorable DIY project! I think it’s easy enough for me to try too! This is right up my alley! Great tutorial, you make it look so easy and classy! What an adorable little DIY! I’ve tried to get a bit more organized with my holiday decor. Still a work in progress, lol. My decor is always a work in progress! lol – and when it’s done, I still change things….